A high-output addition to the range of Baker Perkins SBX Master™ twin-screw extruders offers cereal and snack manufacturers significantly higher capacities over a broad range of end products. Nominal throughput of the new SBX Master™ 125 is 2,300 kg/hour of direct expanded products, compared with the previous maximum of 1,500 kg/hour. It meets a growing demand for high-efficiency, high-output lines to make a wide variety of expanded and co-extruded snacks and cereals,including high added-value products. The SBX Master™ incorporates a motor and gearbox combination doubling the torque capacity of previous generation extruders. High torque increases throughput, enhances product consistency, and extends the range of products that can be made through an ability to handle denser materials. The flexible Baker Perkins die design and segmented agitator configuration - allowing quick product change-over - together with the high free volume agitator geometry also contribute to high outputs, even on low density materials such as bran and fine milled flours. The modular barrel enables the length of each machine to be matched precisely to the customer’s process application, and enables extension later as production needs change. Easy cleaning and maintenance are increasingly stressed as key to low cost of ownership. The AC drive system of the SBX Master™ is virtually maintenance free, and innovative open-frame design maximizes access for cleaning and maintenance. The splined shafts and high torque capacity of the gearbox are designed for optimum reliability and durability. The SBX Master™ is particularly easy to use, with PLC touch-screen control, and time-saving automatic start and stop sequences as standard. 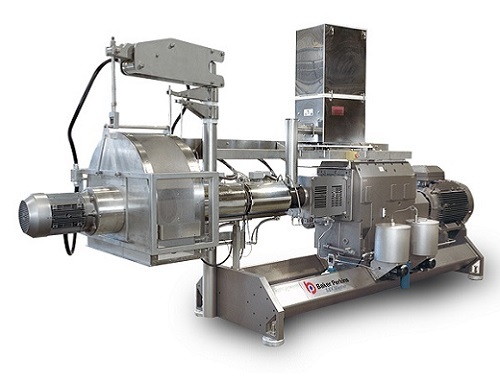 Extruder flexibility is at the heart of the Baker Perkins Snack Master™ expandable line concept. This allows the product range from a standard line to be extended from direct expanded snacks and cereals to higher added-value products to respond to changes in business objectives and market conditions. In the snacks industry this means that a Snack Master™ line making popular products such as corn curls, chipsticks, and maize rings can be extended in stages to produce a full range of high-specification snacks including whole grain / multigrain and sweet or savoury filled pillows.